"By merging online learning theories with hands-on digital interactives, institutions can deliver a truly productive, individualized, and fun learning experience," said Dr. Boersma. Dr. John Boersma, founder and CEO of Adapt Courseware, the provider of comprehensive online curriculum resources that personalize learning, will be leading an interactive session at the upcoming 2012 Sloan Consortium International Conference on Online Learning. A former university faculty member, Dr. Boersma will discuss his vision for the best online learning experience and show educators how they can dynamically deliver content in a manner that meets the digital literacy and expectations of their students. As a seasoned physics instructor, Dr. Boersma brings a pragmatic understanding of how students learn today, how they want to learn, and how they can more effectively learn. Under Dr. Boersma’s guidance, the Adapt Courseware team has conducted research to develop a set of best practices that focus on online learning experiences which can drive measurable learning outcomes. 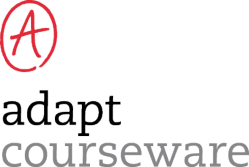 Adapt Courseware’s innovative approach to adaptive learning combines proven learning science with advanced multimedia design to better engage and motivate each student to obtain competencies that lead to mastery learning. The company’s online curriculum resources direct students to the right learning activity at the right time so they are more likely to actively learn the content. “What Would the Best Online Learning Experience be Like?” will take place on Thursday, October 11th at 11:25 a.m. The 2012 Sloan-C conference is being held at the Walt Disney World Swan and Dolphin Resort in Lake Buena Vista, Florida from October 10th through 12th. Sloan-C is an institutional and professional leadership organization dedicated to integrating online education into the mainstream of higher education, helping institutions and individual educators improve the quality, scale, and breadth of online education. Adapt Courseware individualizes the learning experience for each student based on academic abilities and needs. The company offers complete, customizable, online curriculum resources that combine proven learning science with advanced multimedia techniques to help students achieve mastery learning. With Adapt Courseware, colleges and universities can realize measurable learning outcomes, increased student retention, and higher student satisfaction.